Mason Van Buren Jennings, the 6th president. 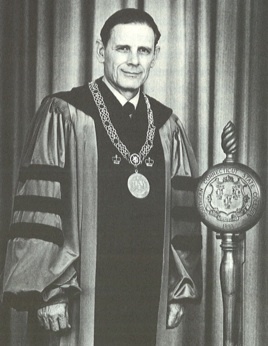 When Buley retired in 1970, the college had a new president, Manson Van Buren Jennings. Jennings was more scholarly than his predecessor, having spent a good portion of his professional life lecturing at Teacher’s College, Columbia and some time as a dean in New York. In this respect, he was a throw back to adminstrators of the past. A graduate of Harvard and a PH.D. from Columbia, he enjoyed smoking his pipe and listening to his “hi-fi” system. In the mid-seventies, Southern adopted a “virtually open” admissions policy to counteract the falling enrollment rates. In the fall of 1974, Southern’s population fell for the first time since WWII. Hoping to raise enrollment, Southern developed a journalism program, and established majors in health sciences and computer sciences. A graduate program in marriage and family counseling was also added to the curriclum. Although the University of New Haven was stopping the creation of a business adminstration major, SCSC was adding accounting, marketing and management classes into the economics department. Before Pauline Lange retired in 1980, she led the creation of the social work major and graduate program, despite opposition from the University of Connecticut. When the Connecticut General Assembly decreed that eighteen year olds could legally purchase and consume alcoholic beverages beginning October 1, 1972, Southern students had an alternate to political activism. As of March 21, 1973, the sale of beer began at Southern and the beer began legally flowing. The Owl’s Nest Pub became a favorite spot for students. The college’s trustees thought it would be better to have students drinking their beer in a carefully regulated college facility.Big-name rock and roll acts were coming to the school too, The Guess Who performed at Lyman in 1971, and both The Byrds and Stevie Wonder appeared in 1972. But by the mid-seveties, musicians were demanding such large fees that the concerts were a thing of the past. Peter Korman, who won a bronze medal in floor excersise at the 1976 Olympic Games in Montreal. 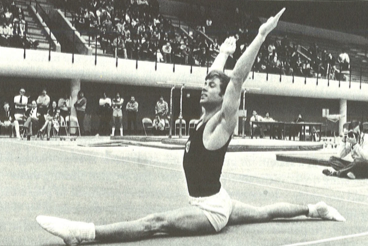 The men’s sport that attracted more attention than any other at Southern during the 70s was gymnastics. Abie Grossfield produced NCAA Division II Championship teams in 1973, 1975 and 1976. One of his gymnasts, John Crosby, won gold medals in worldwide competition in the Soviet Union in 1971 and 1974, and another, Peter Kormann, won a bronze medal at the 1976 Olympics in Montreal, and was the first American gymnast to win an Olympic medal in fourty-four years.